"On April 19 myplasticheart will celebrate the opening of Hanna-Barbarians, a group show featuring the work of over 20 artists from the U.S. and abroad. The show’s name is a tongue-in-cheek reference to its theme, with all artists creating pieces using elements from their favorite cartoons. This is a chance for these artists to showcase those cartoons that have influenced them throughout their careers, sometimes being critical elements in their development and interest in the arts. The show is curated by the Studio Miners, Evoker & Team Sweet, who find joy in documenting the wonderfully exciting world of artists, collectors and creatives of all kinds. This theme particularly appealed to the Studio Miners because in their travels and studio visits, they were always fascinated to see what imagery other artists surrounded themselves with to stimulate creativity. 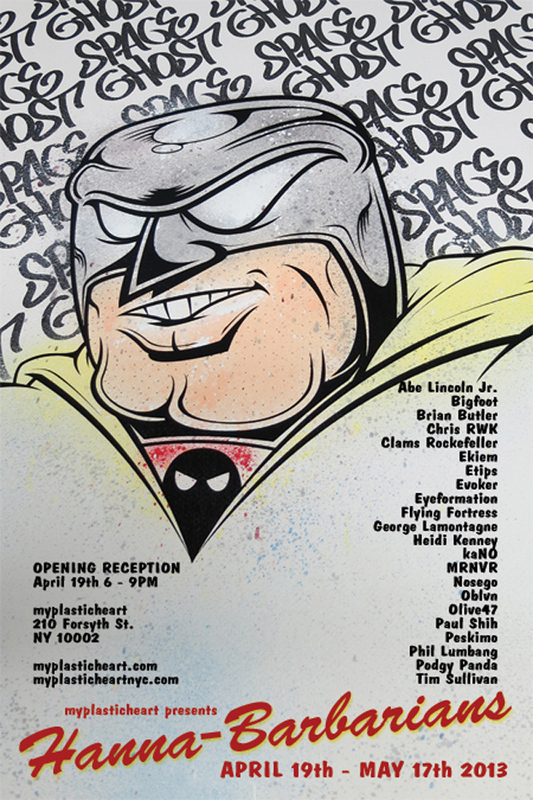 The opening will take place on Friday, April 19 from 6 – 9pm and the show will run until May 17. In anticipation of the opening, we will feature several sneak peeks of art from the show on this blog. To sign up for our preview list contact previewme@myplasticheart.com."